Do you store lots of important photos and videos in your LG Optimus or other Android smartphones? This is very convenient considering that you always have your phone with you and you can take photos of important and memorable events in your life without a video camera or without hiring someone to do the tasks for you. However, your android smartphone files might be accidentally deleted once you hit the delete button unintentionally while enjoying a photo or video. Or your LG Optimus could be broken or damaged so that you cannot open your files anymore. This situation could be disastrous especially if you have not made a back up of your photos and videos. But you can still do something about this problem. Modern technology has made some breakthroughs and there is now software that will help you recover deleted photos and videos. In truth, the deleted content isn't really gone or formatted from your phone, the memory sector containing the 'deleted' files are just labelled as empty while in fact it is not, the content will truly erased only when this sector is over written by new data. However, it is still possible to getting back the videos or photos on your LG phone you deleted by accident, Android Data Recovery Application will be your best choice to retrieve lost Data from your LG G3 phone without any quality loss. The application can be able to deeply scan all storage system on your Lg phone including SIM, internal memory and SD card. If you're looking for ways to recover contacts & messages you lost by accident, a good starting point is this article: How to retrieve contacts & messages from LG G3. Supported LG Devices: LG G2/G3/G4/G5/G6/V10/K10/V10/G5 and other more. Note: Before you start the LG data recovery program, we recommend you stop saving new pictures or videos to your phone memory in case the original dat was overwritten, and creates the certain difficulty for data recovery. If this LG Data Recovery is not yet installed, it can be downloaded from here (Windows or Mac), after you installed the program on your computer, launch it, you will see the main interface below, then directly connect your LG phone to the computer with a USB cable. To let the program identify your phone, you should enable USB debugging, different operating system has different setting procedure. You can refer to the Screenshot commands to enable debugging on your Lg phone. Then press "Start" on the next. 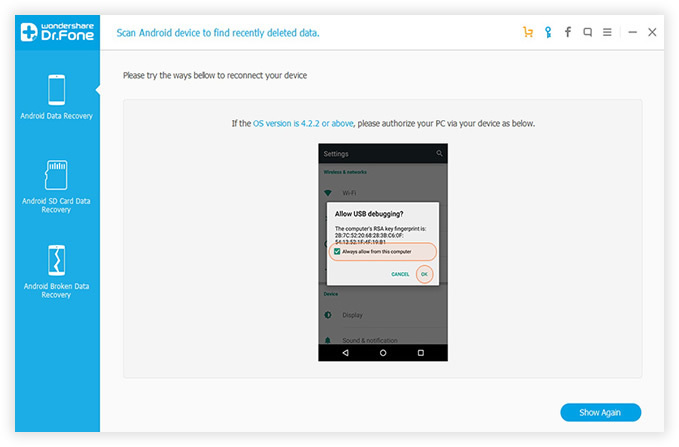 In order to ensure the program can identify your phone, you need to click "OK" on your Android device to allow the program super user authorization when an app Superuser Request pops up, you can follow steps on the screenshot. One of its main functions appears to be that of selectively filtering other scanning options, you can simply choose which kind of type you want to scan and recover, this will be a big timesaver for you. 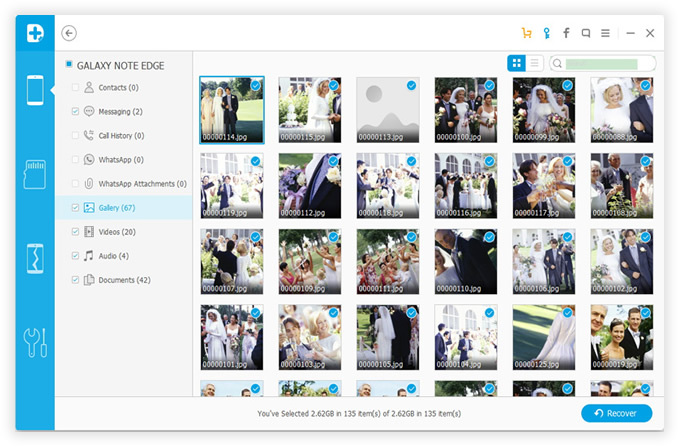 If you only want to retrieve photos or videos, just mark them and click "Next" to proceed directly into the next step. . It will take some time to finish the scanning process, after that, all the lost data will be scanned out and listed in categories, You can simply preview all of the scanned photos or videos 1 by 1 based on categories. And select whatever you prefer to restore and mark them, then press "Recover" to start recovering your data on LG phone. That's all. If your Lg phone was inaccessible, damaged or your data was corrupted or lost due to mis-operation, restore factory rest, system failure or any other reasons, you are able to recover whatever data back to your LG device when you have this LG Data Recovery application in hand, it's capable of retrieving your data in any data loss situation regardless of how failure occurred. I would strongly suggest that you should backup Android data regularly so that you can easily restore the previous backup files to your phone. If you're unlucky enough to experience a loss of access to your LG phone data, I would strongly recommend to power down your Android phones immediately in order to prevent any additional damage to your data, otherwise this makes it hard to recover your lost data.